Charles Borges de Oliveira is a lettering artist and type designer and owner of Borges Lettering. He started his career as an apprentice to a master sign painter and soon began to appreciate letters and layouts. In 2007, he formed Borges Lettering, which in addition to offering high quality fonts, is a design studio that offers hand lettering and logos for all forms of advertising. Charles has done custom lettering work for American Greetings, Crystal Geyser and NBC. 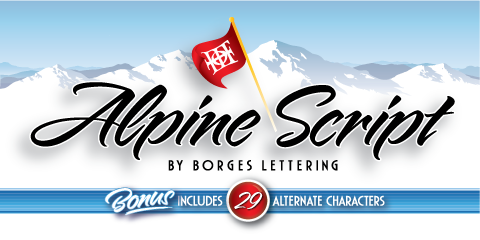 The new releases and latest additions to the IHOF collection are Alpine Script and Sadey Ann. Alpine Script is an adventurous and casual brush script with alternate characters and is well suited for a wide array of design projects including product packaging and other advertising uses. 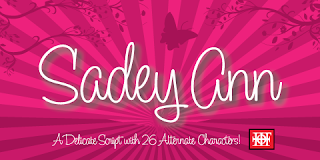 Sadey Ann, named after the designer's daughter, is a more delicate penline script and is also suited for a variety of design uses.